Small-cap drug stock Novavax (NVAX - Get Report) is spending another consecutive trading session at the top of the Nasdaq's most-active stocks. Shares of Novavax sold off 84% on Friday following news that phase 3 results for its respiratory virus vaccine missed their objectives. Now this stock is rallying more than 12% to kick off this week, rebounding from the huge free fall that ended last week. Don't get lured in by the double-digit rebound in Novavax. Atthis point, it looks like we're simply seeing a relief rally following the sheer size of Friday's selloff. It's far too early to call a meaningful support level established in NVAX. Buyers beware. Shares of small-cap tech stock Infoblox (BLOX are up more than 15% this afternoon, rallying hard following news that private equity firm Vista Equity Partners is buying the company is a deal worth $1.6 billion. Infoblox shareholders will get $26.50 per share in cash when the deal closes, a milestone that the companies expect to hit in January 2017. In short, the money has already been made on the Infoblox trade; shares have a nearly nonexistent 0.9% merger premium baked in at this point. Investors who missed today's pop should look elsewhere for upside opportunities this week. Sarepta Therapeutics (SRPT - Get Report) is up big this afternoon, rocketing nearly 90% higher on the day as of this writing following a contested FDA approval. The news that the FDA had okayed Sarepta's Duchenne muscular dystrophy drug comes just days after shares popped on news that the FDA staffer who'd previously raised concerns about the drug had left the agency. The drug, which will be marketed as Exondys 51, is being approved under the FDA's accelerated approval program, which opens treatments available for sale while additional data is collected about the drug. 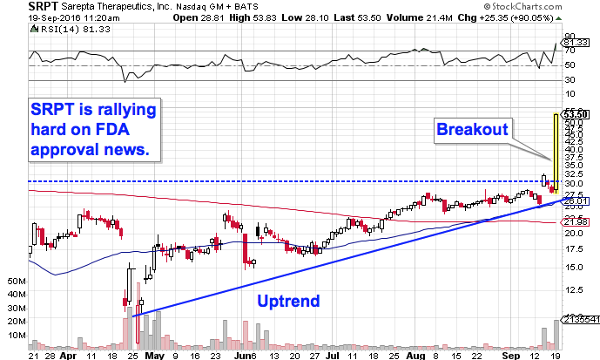 From a technical standpoint, Sarepta is breaking out hard this afternoon. Today's huge rally is sending shares to new multi-year highs, as short sellers get squeezed hard. Coming into this week, approximately 33% of Sarepta's shares were being held short -- and now the positive drug news is sending short clamoring for the exits. Sarepta could have further to run from here, but risks are also elevated following today's near double in shares. Advanced Micro Devices (AMD - Get Report) is seeing another session near the top of the Nasdaq's most-active issues, as this perennially high-volume stock tries to establish a technical support level. AMD started the year in a well-defined uptrend, a level that got violated with the firm's secondary offering at the start of this month. 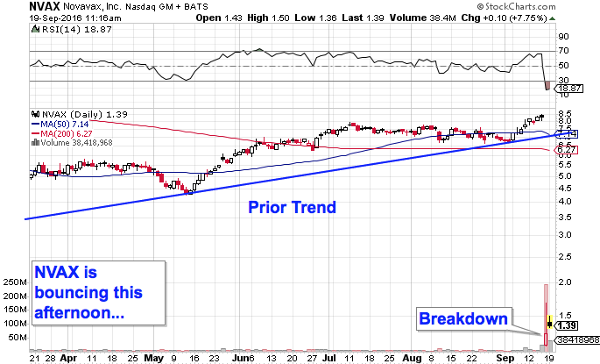 Since then, shares have been establishing a newer support level, potentially keeping the broken uptrend from becoming a prolonged selloff. Buyers should consider jumping in here with a protective stop just below $6 support. The S&P 500 is in the middle of a strong session this afternoon, up about 0.48% to start the week. That's translating into an awful day for anyone who owns that ProShares Ultra VIX Short-Term Futures ETF (UVXY - Get Report) , a leveraged bet on the VIX Volatility Index that's plummeted 86% year-to-date. UVXY is down almost 9% as I write this afternoon, dropping thanks to its long-term inverse correlation with the S&P. 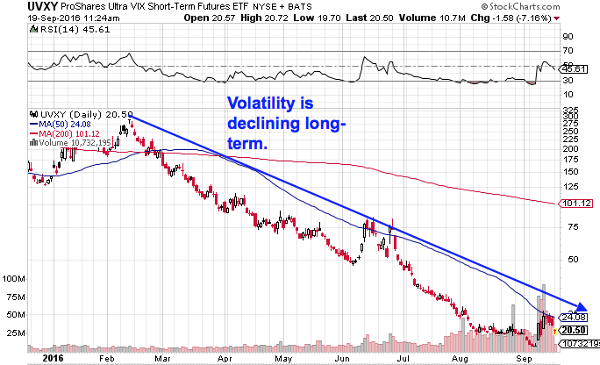 As the broad market tracks higher, VIX funds are trying to recapture all-time lows. As long as the primary trend in the S&P remains up and to the right, it makes sense to stay far, far away from exposure to VIX instruments. The Financial Select Sector SPDR ETF (XLF - Get Report) is seeing big volume this afternoon, up slightly following the spinoff of the Real Estate Select Sector SPDR ETF (XLRE - Get Report) . As previously announced, XLF paid out a special dividend in the form of XLRE shares to investors on Friday, splitting apart real estate component that formerly made up the Financial Select Sector Index. Some financial Web sites are erroneously showing an 18% selloff in XLF this afternoon because of the effect of that spinoff. In fact, XLF is up 1% this afternoon following the transaction. 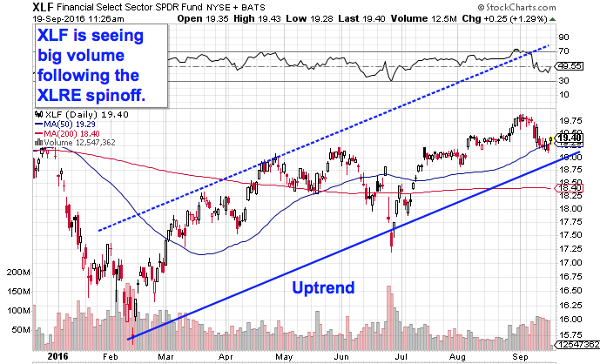 Long-term XLF looks attractive from a technical standpoint. Shares have been in a well-defined uptrend going all the way back to February's lows, and the recent correction in the financial sector put this big fund back on the lower end of its price range. Buy the dips in XLF this fall. GoPro (GPRO - Get Report) is up more than 8% this afternoon, rallying hard alongside the firm's unveiling of its Karma drone earlier today. 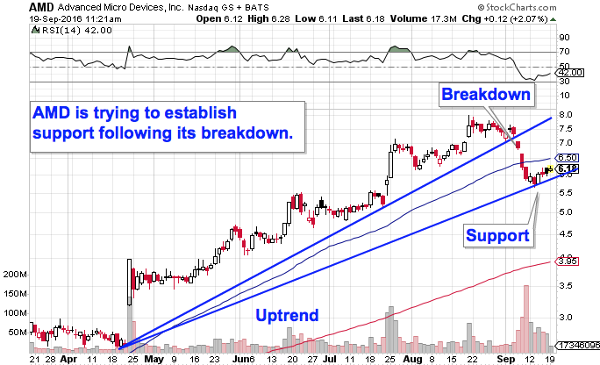 With the presentation still ongoing as of this writing, GoPro is testing an important breakout through resistance at $16, a price level that's been acting like a ceiling for shares since August. Investors are betting on the popularity of drones as a potentially large contributor to revenues in the year ahead. 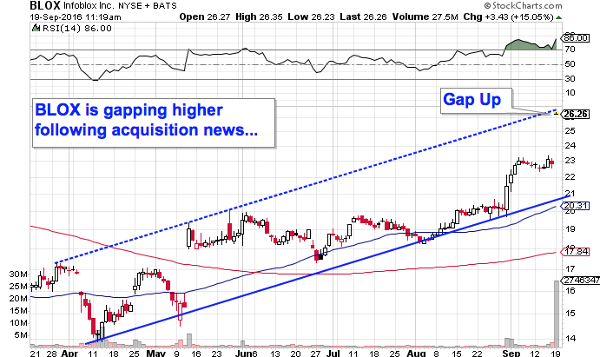 Technically, GoPro looks like it's setting up for a rebound after selling off in the last year. 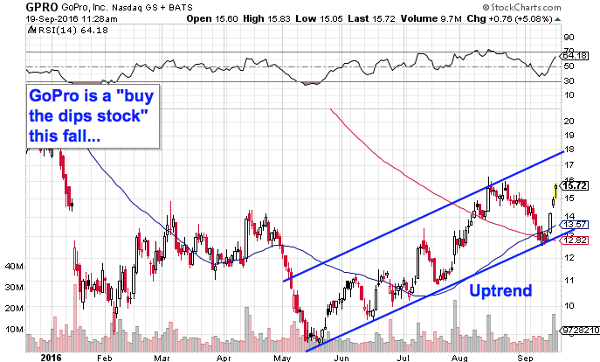 Shares have been bouncing their way higher in a well-defined uptrend since May, and if $16 gets definitively taken out this afternoon, it sets the stage for a more prolonged up-move. If you decide to buy the breakout in GoPro, it makes sense to park a protective stop on the other side of support down at $13.